The Arabian wolf (Canis lupus arabs) is a subspecies of gray wolf which lives on the Arabian peninsula. It is the smallest sized wolf known. It is a desert-adapted wolf that normally lives in small groups and is omnivorous, eating carrion and garbage as well as small to medium-sized prey. 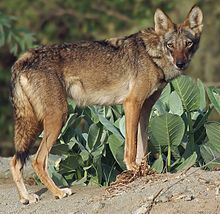 Once thought to possibly be C. l. pallipes (the Indian wolf), the Arabian wolf was designated Canis lupus arabs by the British zoologist Reginald Innes Pocock in 1934. Pocock noted its smaller skull and smaller size. In the third edition of Mammal Species of the World published in 2005, the mammalogist W. Christopher Wozencraft listed under the wolf Canis lupus the subspecies Canis lupus arabs. A 2014 study suggests that genetically the Arabian wolf is closer to C. l. lupus than it is to C. l. pallipes and supports the subspecies designation C. l. arabs. There has been admixture with domestic dogs but it is unclear whether this is why this wolf is genetically closer to C. l. lupus. This raises a concern of extinction by hybridization as Arabian wolves are more adapted to desert life than wolf/dog hybrids. In Israel and the Palestinian Territories there is some disagreement as to the exact taxonomic status of wolves. Some scientists hold that two subspecies of wolf are present- C.l. pallipes in the northern parts and C.l. arabs in the south. They point out that the southern wolves are smaller than the northern wolves which are also darker and have longer fur. Other scientists consider the wolf in the area to be C.l. arabs with no real distinction between northern and southern wolves. As in other countries there is interbreeding with feral dogs which adds an element of uncertainty. In 2018, whole genome sequencing was used to compare members of the genus Canis. The study found evidence of gene flow between African golden wolves, golden jackals, and grey wolves (from Saudi Arabia and Syria). One African golden wolf from the Egyptian Sinai Peninsula showed high admixture with the Middle Eastern grey wolves and dogs, highlighting the role of the land bridge between the African and Eurasian continents in canid evolution. The African golden wolf was found to be the descendant of a genetically admixed canid of 72% grey wolf and 28% Ethiopian wolf ancestry. The Arabian wolf is small for Canis lupus. It stands on average 25–26 inches (64–66 cm) at shoulder height and the adult weighs an average of 45 pounds (20.41 kg). The cranial length of the adult Arabian wolf measures on average 200.8 mm, which is smaller than most wolves. Along with the Indian wolf, it is probably smaller than other wolves to help it adapt to life in a hot, dry climate. This is an example of Bergmann's rule, where mammal size varies by the warmth of their environment. Its ears are proportionally larger in relation to its body size when compared to other sub-species of Canis lupus, an adaptation probably developed to help disperse body heat (Allen's Rule). Arabian wolves do not usually live in large packs, and instead hunt in pairs or in groups of about three or four animals. They have a short thin coat which is usually a grayish beige color, "... a mixture of black and slightly buffy grey" according to Pocock. Similar to other canines, the Arabian wolf does not have sweat glands and so it must control its body temperature by rapid panting, which causes evaporation from the lungs. Occasionally the pads of the third and fourth toes are fused in the back; a feature which differentiates its tracks from a dog's. It is distinguished from the Indian wolf by its smaller skull and smaller size and thinner coat. Arabian wolves are mainly carnivorous, but also omnivorous and in some areas largely dependent on human garbage and excess products. They also feed on hares, rodents, small ungulates, cats, sweet fruits, roadkill and other carrion. Opportunistically almost any small animal including fish, snails, baby baboons can be part of their diet. Because Arabian wolves can attack and eat any domestic animals up to the size of a goat, Bedouins and farmers will not hesitate to shoot, poison, or trap them. The Arabian wolf was once found throughout the Arabian Peninsula but now lives only in small pockets in southern Israel, southern and western Iraq, Oman, Yemen, Jordan, Saudi Arabia, and some parts of the Sinai Peninsula in Egypt. It is rare throughout most of its range because of human persecution. In Oman wolf populations have increased because of a ban on hunting, and they may naturally re-establish themselves in certain places within the region in the relatively near term. In Israel, between 100 and 150 Arabian wolves are found across the Negev and the Arava. The United Arab Emirates and Egypt both have a captive breeding program and the wolf is protected in Oman and Israel but elsewhere its future is uncertain. In Saudi Arabia the wolf is protected in places and still exists in places with sparse human activity. ^ Pocock, R.I. (1934). "LXVI.—Preliminary diagnoses of some new races of South Arabian mammals". Journal of Natural History Series 10. 14 (84): 635–636. doi:10.1080/00222933408654939. ^ a b Hefner, R.; Geffen, E. (1999). "Group Size and Home Range of the Arabian Wolf (Canis lupus) in Southern Israel". Journal of Mammalogy. 80 (2): 611–619. doi:10.2307/1383305. ISSN 1545-1542. JSTOR 1383305. ^ Pocock, R.I. (1934). "LXVI.—Preliminary diagnoses of some new races of South Arabian mammals". Journal of Natural History Series 10. 14 (84): 635. doi:10.1080/00222933408654939. ^ a b Pocock, R.I. (1935). "XLII.—The mammals collected in S.E. Arabia by Mr. Bertram Thomas and Mr. H. St. J. Philby". Journal of Natural History Series 10. 15 (88): 441–467. doi:10.1080/00222933508654985. ISSN 0374-5481. ^ a b Bray, Timothy C.; Mohammed, Osama Badri; Butynski, Thomas M.; Wronski, Torsten; Sandouka, Mohamed Abdelkader; Alagaili, Abdulaziz Nasser (2014). "Genetic variation and subspecific status of the grey wolf (Canis lupus) in Saudi Arabia". Mammalian Biology - Zeitschrift für Säugetierkunde. 79 (6): 409–413. doi:10.1016/j.mambio.2014.06.005. ISSN 1616-5047. ^ Heinrich Mendelssohn; Y. Yom-Tov (1999). Mammalia of Israel. Israel Academy of Sciences and Humanities. ISBN 978-965-208-145-2. ^ Lopez, B. (2004). Of Wolves and Men. Scribner. p. 18. ISBN 978-0743249362. ^ Walker, Brett (2008). The Lost Wolves of Japan. University of Washington Press, Seattle. p. 53. ISBN 9780295988146. ^ T. K. Fuller (2004). Wolves of the World. Voyageur Press. ISBN 978-0-89658-640-6. ^ Mills, Clarence A. (1945). "INFLUENCE OF ENVIRONMENTAL TEMPERATURES ON WARM-BLOODED ANIMALS". Annals of the New York Academy of Sciences. 46 (1 Animal Colony): 97–105. doi:10.1111/j.1749-6632.1945.tb36162.x. ISSN 0077-8923. ^ Natural Emirates: Wildlife and Environment of the United Arab Emirates. Trident Press Ltd. 1996. pp. 219–. ISBN 978-1-900724-02-9. ^ a b c Hefner, R.; Geffen, E. (1999). "Group Size and Home Range of the Arabian Wolf (Canis lupus) in Southern Israel". Journal of Mammalogy. 80 (2): 611–619. ISSN 1545-1542. doi:10.2307/1383305. ^ a b Pocock, R. I. (1935). "The Races of Canis lupus". Proceedings of the Zoological Society of London. 105 (3): 647–686. doi:10.1111/j.1096-3642.1935.tb01687.x. ISSN 0370-2774. ^ Harrington & Paquet 1983. ^ Walter W. Ferguson; Susan Menache (2002). The Mammals of Israel. BERTRAMS p. 73. ISBN 978-965-229-278-0. ^ http://nwrc.gov.sa/NWRC_ARB/mzyd_files/1-1994-005.pdf Biquand, S., V. Urios, A. Baoug, C. Vila, J. Castroviejo, and I. Nader. 1994. Fishes as diet of a wolf (Canis lupus arabs) in Saudi Arabia. Mammalia 58 (3):492–494. ^ Cohen, Orly; Barocas, Adi; Geffen, Eli (2013). "Conflicting management policies for the Arabian wolf Canis lupus arabs in the Negev Desert: is this justified?". Oryx. 47 (2): 228–236. doi:10.1017/S0030605311001797. ISSN 0030-6053. ^ Bray, Timothy C.; Mohammed, Osama Badri; Butynski, Thomas M.; Wronski, Torsten; Sandouka, Mohamed Abdelkader; Alagaili, Abdulaziz Nasser (2014). "Genetic variation and subspecific status of the grey wolf (Canis lupus) in Saudi Arabia". Mammalian Biology - Zeitschrift für Säugetierkunde. 79 (6): 409–413. ISSN 1616-5047. doi:10.1016/j.mambio.2014.06.005. ^ Gecchele, Lisa V.; Bremner-Harrison, Samantha; Gilbert, Francis; Soultan, Alaaeldin; Davison, Angus; Durrant, Kate L. (2017). "A pilot study to survey the carnivore community in the hyper-arid environment of South Sinai mountains". Journal of Arid Environments. 141: 16–24. doi:10.1016/j.jaridenv.2017.01.009. ISSN 0140-1963. Wikimedia Commons has media related to Canis lupus arabs.